HIGH POINT, N.C. – (March 6, 2018) — International Market Centers has announced the Spring 2018 High Point Market schedule for IMC seminars and Suite Spot and Hamilton tours. Beginning on Saturday, April 14 and continuing through Tuesday, April 17, 20 seminars and five designer-hosted tours will be open to market attendees. 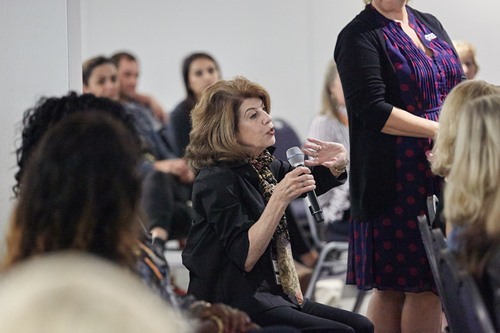 Hosted by industry experts and designers, the schedule of events allows retailers and designers to supplement their buying activities with complimentary programming that encompasses trends, business strategies and forecasts. Trendsetters and influencers lead these tours through the Suites at Market Square and Hamilton-Wrenn showrooms. RSVP required. Speaker: Robin Baron - Robin Baron Design Inc. In addition to the IMC seminars, The Rug Show will host a series of CEU-accredited seminars on the Top Floor of the Suites at Market Square beginning on Friday and continuing through Wednesday. Participants are invited to engage in a one hour complimentary creative workshop, conducted by the Creative Matters team in collaboration with The Rug Show and Cover Magazine. Get away from the computer and let your creativity shine! Mediums will include oil pastel, charcoal, ink, wax resist and various papers. Open to all skill levels and expertise. Limited places, please RSVP to info@therugshow.com and visit www.therugshow.com for more information. Limited places, please RSVP to info@therugshow.com and visit www.therugshow.com for more information. Come join us as we celebrate the beginning of High Point Market Spring 2018. We’ll be serving our traditional Southern Style BBQ with all the fixins. Enjoy good food, good friends, beer, and wine and simply relax while listening to live entertainment. Sponsored by IMC-DesignOnHPMkt. International Market Centers and DesignOnHPMKT bring a strong series of original programming that will appeal to designers, buyers and retailers this spring – offering attendees a wealth of choices to connect with peers, become educated on industry trends, earn CEU credits and get insights on important issues impacting the future.